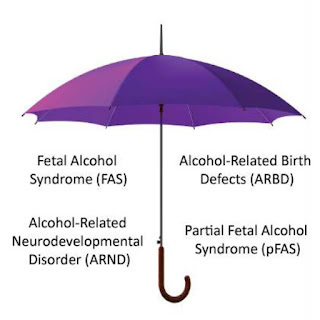 Regular readers of this blog will know how long it took us to get a diagnosis of Alcohol Related Neurodevelopmental Disorder (ARND), which is a diagnosis under the Foetal Alcohol Spectrum Disorder (FASD) umbrella, and ADHD. It took us a while to realise that her challenges and behaviour weren't age related and "just" adoption related. There is, of course, never a "just" when it comes to adoption but it can be easy to miss other diagnoses when you're seeing through adoption spectacles because they can tend to blur other issues. Let's face it, it's hard enough to wrap your adopter head around trauma and attachment issues let alone then working out what else might be going on for our children. Most adopters I know spend a lot of time watching their children and worrying that they might be missing something. You tie yourself up in knots trying to work out why your child is doing this or that and whether you should be doing something about it but then not quite sure who to ask and where to access support. It's a real minefield when it comes to FASD with very few doctors trained in diagnosing the condition. A diagnosis of FAS (Foetal Alcohol Syndrome) is possible via a genetics referral but only if the child has all the facial features associated with the full blown syndrome. Only a small percentage of children have the full blown syndrome and symptoms can vary depending on when during the pregnancy the baby was exposed to alcohol. As a parent in the UK you are lucky if you can find a GP who has actually heard of FASD let alone then be able to access a referral onto someone who is able to diagnose the condition. We were lucky - well lucky and very tenacious. 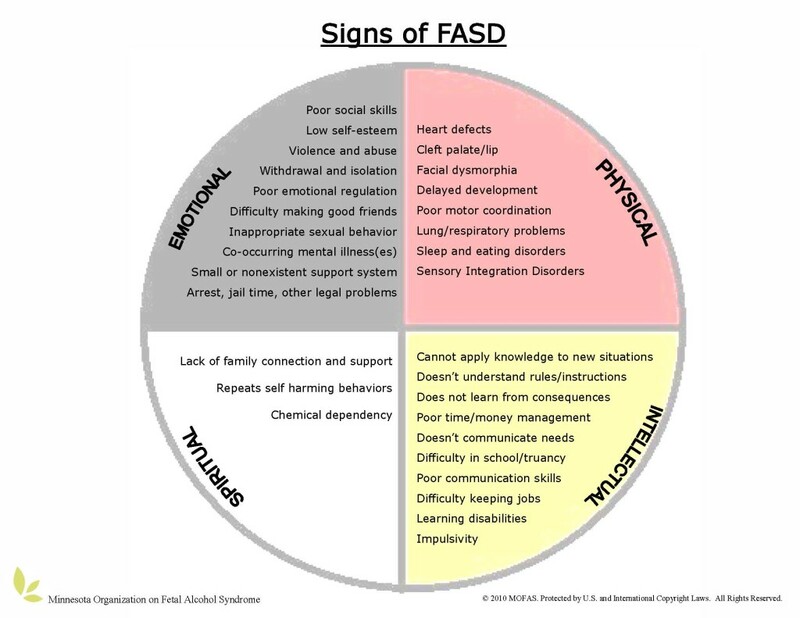 Our GP had never heard of FASD, in fact he wrote ASD in his notes - I had to stop him and inform him that we weren't talking about Autistic Spectrum Disorder. We managed to find a paediatrician locally who was trained in diagnosing FASD through our own resources and agreed to take our our referral. I then went back to the GP with the details in my sticky fingers and asked him to make the referral. Being used to my dymanic approach, he agreed. Having accessed a paediatric referral and received a diagnosis of ARND and ADHD we have turned our attention to trying to understand exactly what this diagnosis means to Katie's functioning. We can easily see her distractability. We know the full force of her behavioural challenges. We watch her struggle with OCD and panic attacks due to anxiety. We are starting to understand that she has processing difficulties but what is driving those co-morbidities? Fed up with her teachers at school telling me "she's fine at school" but seeing the stress that she experiences through a general school day I decided to start finding this out for myself. 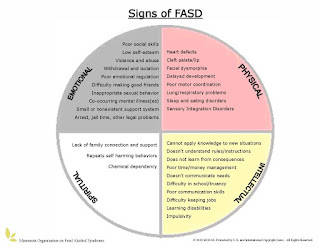 I spend a fair bit of time these days reading up about FASD and asking what other people are doing to help their children with this diagnosis. There are so many symptoms and co-morbidities that it can be hard to know. What other information do we need? It really is a case of piecing it all together because my GP doesn't have a clue. Other than a small head circumference we have ascertained from our paediatrician that Katie has no other physical difficulties except for mild hypermobility. From talking to other parents I learned that with FASD it's often common to have sensory processing challenges as well so that was where I instinctively turned my attention next. I contacted our Post Adoption Social Worker (PASW) to ask if we could access an assessment from an Occupational Therapist via the Adoption Social Fund (ASF) and I also made an appointment independently with a Behavioural Optometrist. Initially the ASF said they would not fund the OT assessment if the issue was related to a physical difficulty but they would fund it if it the assessment was due to trauma. I noted back to our PASW that if being fed alcohol in the womb against your will and receiving a diagnosis of ARND as a result wasn't a trauma then I didn't know what else could be. Thankfully this viewpoint was upheld by the ASF and funding was secured for a full OT assessment towards the end of the school holidays. Whilst we were waiting for the OT assessment I took Katie to meet with a Behavioural Optometrist. This was something I had been recommended to do by a friend who's son has a diagnosis of ADHD and it had been found to be very helpful. This assessment has to be self funded because, despite it being enormously helpful and quite possibly one of the most helpful services we have accessed, we have been told it is not funded by the ASF which is highly frustrating because the cost of this service in our local area is quite high. To deny Katie a service that might actually help her makes me feel very puzzled. The assessment was enlightening in itself and highlighted that Katie's brain processes in relation to her vision are compromised due to the brain damage and her delayed brain development in some areas. Whilst she can see perfectly well her visual processing takes in too much information and struggles to maintain focus and is easily distracted. The easiest way of describing it is to say she sees everything and nothing. Her brain is on permanent sensory overload which impacts heavily on her executive functioning. If you ask her to find a pair of shoes in a cupboard or tidy her room she is unable to pinpoint where those shoes are because she can't see the wood for the trees. She also pre-empts a lot what might be coming next, her brain jumping about in anticipation. I also saw first hand how easily she becomes anxious when her perception of a situation is challenged and how this then impairs her ability to think clearly and function well. Watching the Behavioural Optometrist assessing her was fascinating. We had chosen to go for a 45 minute assessment rather than the several hours long one because I didn't feel Katie would be able to cope and I was correct in that judgement. She was incredibly cooperative (as she always is with other people) but was clearly very strained by the end of the assessment and unable to hold her hyperactivity together. The Behavioural Optometrist immediately reported back that he could see how quickly she questioned her knowledge and how her anxiety prevented her from being able to access information from her brain. This was noted when he asked her to cover her left eye with a lens. Katie covered her right eye so he asked her which eye she was covering. She replied her left and he then asked her to tell him how she came to that information. I was confused at this point because usually she knows her left and right fairly reliably. You could see she was confused and I attempted to jump in to help her but the Optometrist asked me to hold off. He then asked her if she was left handed. She looked confused and then said that she was. He then asked her if she had always been left handed and she said "yes" but looking very confused at this point. He asked her how she knew which was her left and right. She put both hands up to make an L shape but still got confused. He pointed out to me after the assessment that, due to her anxiety about the task, she was unable to access the knowledge she had about which was left and right so ended up questioning everything she knew about this. We have seen this before when a friend at school told Katie she didn't have a cat. She was very upset about this because she does have a cat (we now have 4). At home I asked her if she had a cat and she said she did but because her friend questioned this fact and told her that she didn't she got so confused she was unable to argue her point or even know what the truth was. Imagine an older child or young person with FASD being queried about an event or something about them by the police and giving an inconsistent statement because they literally cannot access the truth from their brain due to anxiety and brain damage. It made me realise just how vulnerable my daughter might be in the future without the right help now. The findings of the Behavioural Optometrist were backed up by the OT when she assessed Katie. Thankfully all Katie's sensory development is age appropriate which ticks one problem off the tick sheet. The conclusion of the OT was that Katie is very inattentive so gave her a diagnosis of ADD, without the hyperactivity element. It isn't commonplace these days to diagnose using that terminology. 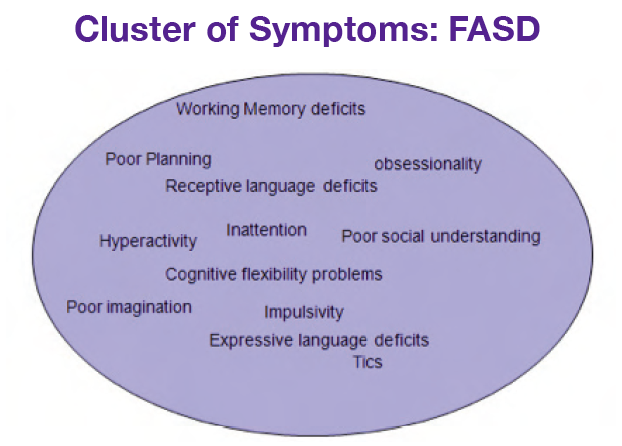 ADHD is an umbrella diagnosis rather like FASD but her description was helpful nonetheless. Knowing that her hyperactivity and distraction is driven by external stimuli rather than internal helps us find a plan to support her. The OT recommended that Katie access a prescription for atomoxetine (also known in the UK as Strattera) which she feels will dampen down the external onslaught and hopefully give Katie's brain the space it needs to develop. Currently the sensory overload is preventing her accessing her memory effectively and is causing her to be highly anxious. I'm curious as to how that will impact (or not) on any brain damage caused by the alcohol exposure but I suspect that will become clear over time. So how do we accessing atomoxetine? Back to the drawing board, although it was a drawing board slightly confused by the OT who didn't think our Paediatrician would be able to prescribe atomoxetine and recommended we access CAMHS (I do love a pipe dream!). To cut a very long few weeks and a self referral to CAMHS short I have now ascertained that our Paediatrician can prescribe said drug so an appointment is pending. I'm going to leave our referral to CAMHS ongoing because there is still the issue of a recommended full psychological evaluation to sort out and to examine her executive functioning and I think we need a referral to CAMHS because Katie's anxiety is impacting on her eating, sleeping; behaviour and mood. 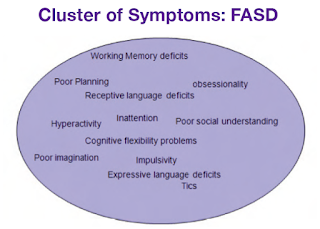 This post is already long enough so I won't go into great details about that but parents with a child under the FASD umbrella will know how intense and stressful it is parenting a child with this condition. Let's just say there isn't much rule following going on here at the moment along with lots of oppositional behaviour. Thankfully the temper tantrums have calmed down considerably although have recently been replaced by panic attacks where she is convinced she is going to be sick. Being sick is one of Katie's biggest fears along with food being out of date and her new one of the house being broken into (thank you to the would be burglars who broke into Nana's house for that new fear – thankfully her house is empty pending the sale so nothing was stolen and no-one hurt). Katie's OT came into school last week to do a class observation and perception test. It only took her 20 minutes in class to see Katie misunderstand instructions. The class had been asked to copy down the days of the week in French, randomly written on the whiteboard and list them in the correct order in their workbooks. All Katie heard of the instruction was to copy the words down, and that is what she did, as a mirror copy of the way they were written on the board. When I asked Katie about the task later on that day she was genuinely convinced she had completed the task correctly. This explains why she doesn't often ask for help - she doesn't realise she's misunderstood. The way we have agreed to help her with this in school is for the teacher to provide a sheet on the table for small group work with the task written on it so Katie can re-read it. This also ensures she doesn't feel singled out. School have agreed to use small groups where possible instead of whole class teaching and approved the use of fiddle toys. We are going to pin fiddle things such as material or soft keyrings into her pockets to keep them discreet. The use of LSA support was noted. Because there is a lot of pressure on the class LSA due to the needs of another pupil this will need to be assessed by the school. Katie doesn't meet the level of need required for an EHCP plan because she doesn't need one-to-one support so this, I suspect, will be a challenge for school. I'm hoping that once the other pupil gets the diagnosis needed to meet the need for an EHCP that additional funding might come out of that and free up the current LSA. I'll have to stay on top of that though. So that's where we are currently: Pending an appointment with the Paediatrician; waiting with fingers tightly crossed that we will meet the criteria for our local CAMHS service; watching to see how school work with the recommendations of the OT; and deciding what we can do about working with the Behavioural Optometrist. One positive that we experienced this week was that we realised there was a link between Katie feeling sick and panicky on a Monday before going to Brownies. Because the Brownie pack has moved to a new hall Katie is struggling with the transition; the new smells; the new hall and this is raising her anxiety levels. After helping her through screaming and hysteria where she wouldn't believe she wasn't going to be sick this has been a massive realisation and enabled her to go to Brownies with a little Cherry Plum Bach Flower Remedy to help calm her down. She is beginning to understand that anxiety for her feels like she's going to be sick. We have a way to go with this but I'm pleased she finally is able to hear what I'm saying to her and know that we can help her through it. thanks for such a comprehensive journal into your life with your daughter - fascinating and helpful reading - thanks so much! Thank you for this post. This has given me food for thought as far as Missy is concerned. 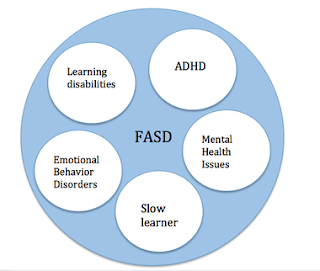 This is a great post - parenting a child with FASD requires us to be detective, researcher, advocate all while parenting a child with complex needs. You are doing an amazing job - all good wishes to you. Never heard of a 'behavioral optometrist' before - will definitely look into that. 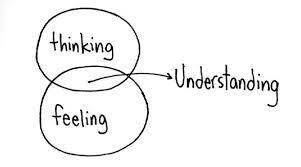 Totally understand. We have a daughter with almost identical issues. We just want her future, like you do for Katie, to be ss 'normal' as possible. Let's pray it's not a pipe dream and keep working for that. Thank you for your honesty and tenacity. Both my sons would do the task as you describe Katie doing. It is not because they are not following instructions, but because they follow the literal instruction rather than the implicit instruction. Correct order literally means to them the order they are written in. 16 year old with dyspraxia has just answered a Business Studies A level question on pricing strategy by writing about the cost of marketing and advertising. Price to him literally meant money. He is otherwise intelligent. But issues like this can cause so much stress unless it is broken down by the teacher, and you talk through [social stories?] some of the ways people can mean one thing or tease or joke without it literally being true. Ditto the cat story. It is a form of banter children often use that gets completely misunderstood by our children. Even professionals will ask questions that children want to answer "correctly" and they give the answer they think they are meant to give and the [stupid] professionals don't even realise this when they ask the question. I personally am completely confused by people like driving instructors ask me whether I intended to turn left or right in a semi confrontational testing way = I get flustered and incredibly anxious. My children hate being assessed - it brings out the absolute worst in them. You can apply for an EHCP without the school supporting you. I would suggest you do straightaway, whatever they say; it might actually increase the support they offer. Do NOT be fobbed off by them saying that her level of need is not great enough = school is making her extremely anxious, that is a high level of need. She is well behaved because she is frightened of getting something wrong, and as you say, she is indeed getting "things wrong" both socially and academically, because she is not supported enough, because they do not have the funds, because they do not have an EHCP for her.